We just released our latest library in the Evolution series of guitar products. 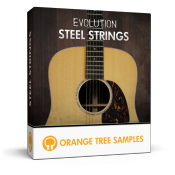 Evolution Acoustic Guitar "Steel Strings" features an extensively sampled acoustic steel string guitar, with a gorgeous, warm tone. We've included both picked and fingered articulations from sustains to palm mutes, harmonics, tapping, and lots of body hits and other effects. As with the Strawberry electric guitar, you also get a rhythm engine for realistic strumming as well as the main lead guitar engine. At 6.5 GB, this is one of our largest libraries yet!